'S e lann-cluiche bhuill-choise nàiseanta na h-Alba a th' ann am Pàirc Hampden, ann an Glaschu. Tha i na dachaigh do C.B. Queen's Park agus Sgioba nàiseanta na h-Alba. 'S i aon de dhachaighean a' bhuill-choise a th' ann an Hampden, agus chomharraich i an cuimhneachan ceud aice air 31 Dàmhair, 2003. Tha oifisean Comann Ball-coise na h-Alba na broinn cuideachd. Thèid geamaichean a chumail ann rè ìrean tràithe de Cho-fharpais ball-coise Oilimpeach 2012. 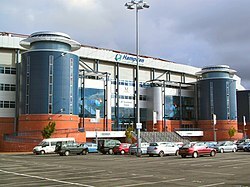 Air a tharraing à "https://gd.wikipedia.org/w/index.php?title=Pàirc_Hampden&oldid=515682"
Chaidh an duilleag seo a dheasachadh 22 dhen Chèitean 2016 aig 16:48 turas mu dheireadh.